New York Rangers goaltender Henrik Lundqvist today launched the Crown Collection, a selection of apparel he designed that will benefit the Garden of Dreams Foundation. Launching the Crown Collection is just one way that Lundqvist, a spokesperson for the Foundation, is committed to helping fulfill Garden of Dreams’ mission of making dreams come true for children facing obstacles. In the six years since the Foundation's inception, Lundqvist has inspired thousands of special children through Rangers ticket donations and hosting events. The Crown Collection, which features a crown logo with Lundqvist’s number thirty at the center, will include a distressed-style baseball hat and tee-shirt available in adult and youth sizes. The Collection will be sold exclusively at retail stores at Madison Square Garden beginning today. A portion of all proceeds will benefit Garden of Dreams. The crown seen on Henrik Lundqvist's mask will now be part of a line of apparel sold exclusively at The Garden to benefit Garden of Dreams Foundation. 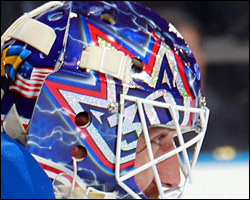 “I am very excited to debut the Crown Collection,” said Lundqvist. "I have had this idea for a while now and it's really exciting to finally see it come to life. I look forward to sharing this with my fans, and most importantly, raising money and awareness for the Garden of Dreams Foundation, an organization that does amazing work to raise the spirits of children who have been dealt a tough hand." Garden of Dreams is a 501(c) (3) non-profit charity that works closely with all areas of The Madison Square Garden Company, including the New York Knicks, Rangers, Liberty, MSG Networks, MSG Entertainment and Fuse. Garden of Dreams has worked tirelessly to fulfill its mission by creating unique and unforgettable events and activities – often involving unprecedented access to Madison Square Garden celebrities, events and venues – that have brightened the lives of thousands and thousands of special children and their families. For more information on the Garden of Dreams Foundation, visit www.gardenofdreamsfoundation.org.